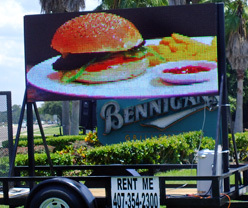 RENT EYE CATCHING LED SIGNS! Advertising your business in Palm Bay just got easier! Introducing the Mobile L.E.D. Sign! These signs really stand out and offer a series of custom programmed messages to fit your every need! When you rent one of our L.E.D. signs we'll deliver them to your Palm Bay location, parking them in front of your store or parking lot and they run on standard electrical outlets or by its self contained generator system. If you're not getting the kind of walk-in traffic that you need to keep your business running-- You'll love the traffic that these LED Signs can generate! 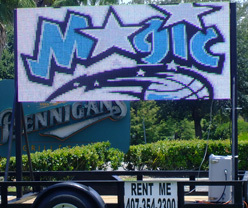 LED Signs for Rent in Palm Bay, Florida. Mobile L.E.D. 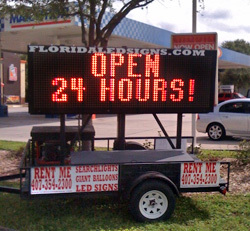 Signs are a Great Way of Driving More Traffic to Your Next Big Sale, Grand Opening, Concert, Carnival, Party, Church Revival, Flea Market Event or Any Other Reason Why You'd Need to Bring as Much Attention to From Oncoming Road Traffic in Palm Bay, FL!